Onam is an annual Hindu festival with origins in the state of Kerela in India.In 1961,due to the popularity and presentation of the rich culture of the state.It becomes the National Festival of Kerela. Onam is also known as Thiru-Onam or Thiruvonam (Sacred Onam Day). Another name for the festival is the ‘Sravanmahotsav’. Every year it is celebrated in between the month of Aug-Sep, which is the beginning of the month of Chingham,the first month of the Malyalam Calendar. On this day, People put flower mats in front of their houses, to welcome the King. There will be competition for the laying of flower mats. The Festival,Onam last for ten days. Keralites all over the world celebrate ten days with pomp and gaiety. First day, Atham and tenth day, Thiruonam are most important of all. They wear new dresses and visit temples. During the festival, various activities are organized such as the boat racing, music, dance, fireworks and lots more in which both old and young participate with equal enthusiasm. 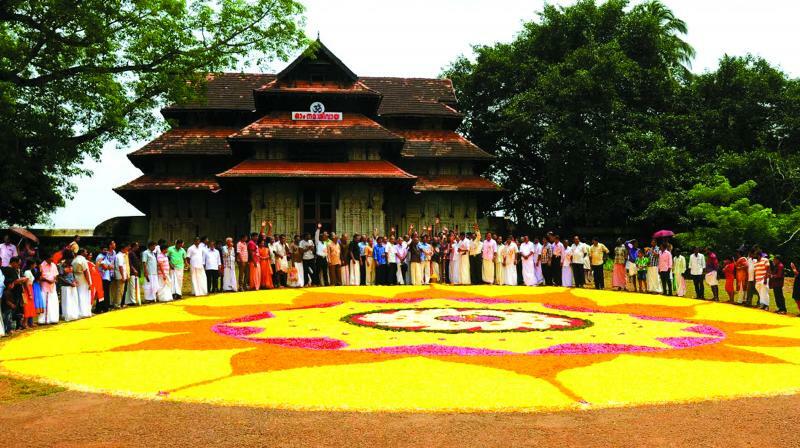 The festival of Onam brings along with it all the colours of Kerala-its history, its culture, its beliefs. The Major attractions of the festival are, Designing of beautiful flower carpets called Pookalam, preparation of banquet lunch, organization of snake boat races, Puli Kali, and the dances like Kaikottikkali,hiruvathira kali Thumbi Tullal dance. Onam-Sadya, An elaborated meals is an important part of the Onam Festival. Meals include rice along with at least 4 varieties of dishes along with traditional pickles and papadam and dessert called ‘payasam’. All these are served on Banana leaves.